If you’re reading this, you’re no doubt aware that removing and/or preventing the spread of pool algae can be easier said than done. The more informed you are about the problem, the better your chance of removing pool algae from your life for good. 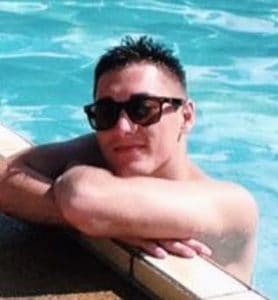 That’s why, today, I’m gonna you the skinny on not only how to remove algae from your swimming pool, but also how to prevent it from ever coming back. What Is Pool Algae & Why Is It Bad? Swimming pool algae is a pretty common problem among pool owners, and it’s one that needs to be dealt with before it spreads because it can end up costing you a small fortune to fix. Algae is a single-celled plant that uses photosynthesis to create food and feed itself. In other words, it can survive on sunlight alone. There are a lot of different types of algae. It can be found in pools and ponds, as well as on dry land. It can also appear in a range of different colors and forms, meaning it is resilient, and can adapt to almost any conditions. Some forms of algae can be incredibly harmful to your health, but others are just an inconvenience for pool owners and aren’t very nice to look at. The microscopic size of algae means that there are already millions of these plants generating before we can even see them, so the best course of action is prevention, which means staying on top of pool care is essential in order to stop this invasive menace. If algae is left untreated, algae blooms can form in your pool. An algae bloom occurs whenever there is a significant nutrient imbalance, causing the algae to grow out of control. As you can imagine, algae blooms pose a health risk, but they can also damage your pool equipment and turn your refreshing piece of paradise into a gloopy green nightmare! Recognizing an algae bloom in your swimming pool isn’t too difficult, since you can identify them by the the water discolouration caused by their pigments. In some cases, an algae situation can ruin for the fun for everyone. If there is thick white, green or red-brown scum on the surface of your pool water, DO NOT enter the pool. Always avoid activities that may involve the risk of being close to or swallowing this kind of organism as it may affect your health. If you, your children or your pets become sick after coming into contact with suspected infected water, please speak to a doctor for advice. So, don’t be ashamed if your pool has algae. It’s almost an inevitable problem that most pool owners have to face! Simply identify what type of algae is infecting your pool and start treating the problem to get back to perfection. You can learn more about the different types of algae, how to identify them and how to treat them below as well as some techniques for algae prevention and treatment. Pool Algae Profiles: What Are The Different Types Of Algae? There are billions and billions of algae in the world and in our water systems. It is an organism with between 30,000 and 1,000,000 known varieties discovered! Unfortunately, we don’t have time to go through them all. So, to narrow it down a little, here are four common types of algae that you might find in your pool. Below you will learn about the different types of algae, how severe they can be and how easy they are to prevent or treat in a simple profile format that will answer your questions. How Common Is Green Algae? This is the most commonly found type of algae. It can be found in both fresh water and marine water. Despite the name, green algae can be found in a range of colors including: blue-green, yellow-green and dark green. It may appear in spots of green around the edge of your pool and be more concentrated in areas with high levels of shade. The cause of green algae is usually not following standard pool maintenance routines and allowing your pool to reach a low pH or alkaline level. If you stay on top of your pool care, you should be less likely to encounter green algae lurking in your pool. Learn more about the best pH level for your pool and how to rebalance your water by shocking your pool with chlorine – You can find the method for doing this below. Afterwards, use a good quality algaecide to kill the remaining bacteria. How Common Is Mustard Algae? This type of green algae is the most commonly found strain that is found in swimming pools. How To Identify Mustard Algae? Mustard algae can come in a greeny-yellow or brown color. People often mistake dirt with a problem with mustard algae, so why not try the following to see if you’re worried about nothing? All you have to do is run your finger over the suspected area. If it feels gritty, you simply need a good clean. If the substance feels slimy or gooey, mustard algae could be forming. Mustard algae can be dispersed easily but will return very quickly to the same location. It loves to climb up the walls of your pool too, so look out for trails upwards. If you have mustard algae, this doesn’t necessarily mean that you have been neglecting your pool – In fact, it’s quite the opposite. Mustard algae can survive in pools with a low level of chlorine and a nice water temperature. It can even infect pools that are highly maintained despite cleanliness levels, decent water filters and a proper water balance. Mustard algae can resist standard levels of chlorine and hide on pool toys, filters and even your swimming costume waiting to re-infect your pool. 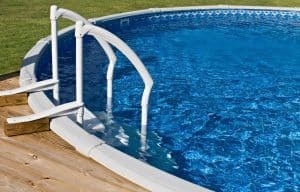 This is why, if you get mustard algae, you must treat all items that may have come into contact with the contaminated water as well as the pool itself. You must also scrub away any visible spores and shock your pool to rebalance the water and make it safe again – Find out how to shock your pool water below. Then apply a good algaecide to your water and you should be good to go! How common is black algae? Black algae can often be found in between tiles and in cracks on pool surfaces. It grows in shaded areas of the pool. However, it is uncommon to find black algae in your pool if it has a vinyl lining. How To Identify Black Algae? This type of algae is actually, a blue-green color. It often has a thick slime layer and skeletal style growths on it that make it resistant to standard chlorine levels. Black algae can find its way into your pool in a range of ways including contaminated swim suits and the weather but is most commonly found growing on plaster in concrete or tiled pools. Prior to and during treatment, the algae has to be thoroughly brushed in order to open up the slime layer and allow treatment to reach the roots of your problem. You then need to balance your pool water and use algicide in severe cases. How Common Is Pink Algae? This type of algae isn’t actually algae at all, it is a form of slow spreading bacteria. It is rare that pink algae would ever take over an entire pool. How To Identify Pink Algae? Pink algae appear in spots or streaks around corners and cracks in your pool. 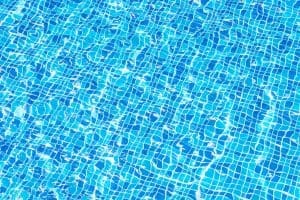 You can often find it on the smoother surfaces of your pool in hard to reach places such as your steps. This sort of algae will thrive if you allow your chlorine levels to drop. Stay on top of the chemicals that you should be adding to your pool and you are instantly less likely to have an issue with this type of algae. Shocking your pool with a high level of chlorine should treat pink algae effectively. Also, if you throw all of your pool accessories into the water during treatment, this will help to prevent reinfection from any spores looking to escape and leave your pool algaeless for a little longer. How To Get Rid Of Algae Fast? As I said earlier, the best course of action with algae is focusing on prevention, so we’ve compiled this list of things that you can do to reduce your chances of developing a serious algae problem. Shocking your pool water is an essential step in keeping it clean. Also referred to as super-chlorinating, shocking is when you add three to five times your normal amount of chlorine or other pool cleaning chemical for a short period of time. This helps pool owners to remove kill bacteria, organic substances and ineffective chlorine amounts. We recommend that you shock your pool weekly to prevent algae from infecting your pool. There you have it, the best way to remove the threat of algae from your pool water is to shock it and create an effective pool water management routine. It’s the price that we pay and a necessary evil to enjoying a lovely dip on a warm day. Preventing algae from getting into your pool water doesn’t have to be a struggle either as pool cleansing products and easy to get hold of and there are many brands to choose from. So, stock up on some chemicals, get shocking your pool on a regular basis and create a routine that works for you. Afterwards, you can swim with confidence that you aren’t doing so alongside many microscopic organisms. All you need to do is take a proactive approach to your pool maintenance.